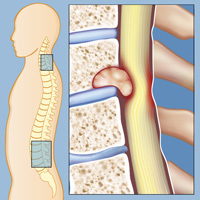 When cancer metastasizes (spreads) from its original location, a tumor may form in the vertebrae (bones) of the spine. Less commonly, a vertebral tumor may be a primary tumor, meaning one that originated there. A primary tumor is one that originated in the area in the area in which it is found. A metastatic tumor is one that develops as an extension of another cancer (such as lung, breast, colon, or kidney). More than 40 percent of all patients who have cancer elsewhere in the body, including breast, lung, prostate, thyroid, renal, and colon, will experience the spread of their cancer to their spine in their lifetime. A benign spinal tumor usually has definite borders and clean edges and does not infiltrate into healthy tissue. A benign tumor is not cancer, but it may need to be removed if it’s causing symptoms or creating pressure on the spine. Benign spine tumors include meningiomas, schwannomas, osteoid osteomas, and osteoblastomas. A malignant tumor is a cancerous growth that spreads and infiltrates into other tissue. 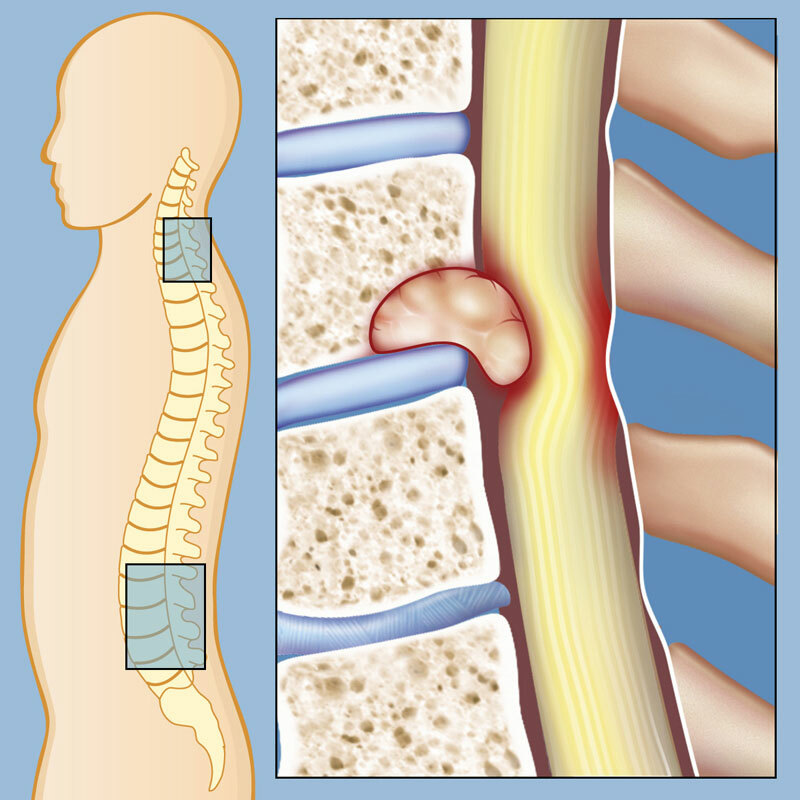 Malignant spine tumors include chondrosarcomas, Ewing sarcomas, and osteosarcomas. Spinal tumors may be (left to right) intramedullary, intradural-extramedullary, or extradural. Intramedullary: These tumors grow in the spinal cord itself, or in the nerves extending from the spinal cord, usually in the upper spine or neck (called the cervical spine). They are often astrocytomas, ependymomas, or hemangioblastomas. Intramedullary tumors are usually benign but can also be difficult to remove due to their location. Intradural-extramedullary: These are tumors that occur outside the spinal cord but within its protective covering. These tumors are often meningiomas, Schwannomas, or neurofibromas. Like intramedullary tumors, these tumors are often benign, but they can be difficult to remove surgically and may recur after treatment. Extradural: These are the most common type of spinal tumors, forming outside the spinal cord and the dura in the bones and cartilage of the vertebrae. Some extradural tumors, such as osteosarcomas, osteoblastomas, and osteoid osteomas, arise from the vertebrae themselves (primary), but extradural tumors are more often metastatic tumors that spread from cancers of the lung, breast, prostate, and kidney. The treatment and prognosis for a spine tumor vary based on whether it is primary or metastatic, benign or malignant, and other factors. Treatment at a major brain and spine center will give patients the widest range of expert treatment options, along with access to clinical trials for spine tumors. Treatment options include surgery, radiation, chemotherapy, or a combination of all three depending on the unique circumstances associated with each individual tumor (see Diagnosing and Treating a Spinal Tumor). 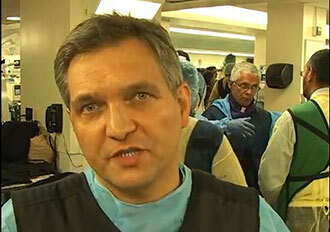 In addition, control of pain and preservation of neurologic function is a major focus of spine tumor treatment centers. To that end, multiple treatment options are available ranging from surgery to correct spinal deformity or neural compression to interventional techniques where cement is injected into the bone to help strengthen the spine. Please contact us for further information.